Is a cosmetology license required in Georgia? Yes, you must have a cosmetology salon license and it is the responsibility of the salon owner to ensure that each person performing services in the salon has a license to provide those services. Salon licenses and individual licenses must be posted in the salon. 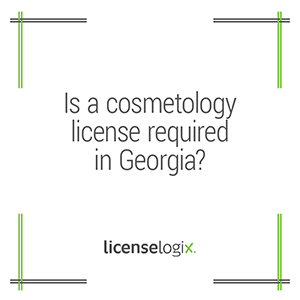 To legally operate a salon in GA you must wait for your license approval from the Board of Cosmetology before opening your doors for business. GA offers individual licensing in the following areas; Master Cosmetology, Esthetician, Nail Technician, Hair Designer, Master Cosmetology Instructor, Esthetician Instructor, Nail Technician Instructor, and Hair Designer Instructor, Cosmetology Apprentice, Esthetician Apprentice, Hair Designer Apprentice, Nail Tech Apprentice. For additional help you can click contact us, or call (800) 292-0909.